Scarlett Martin's life is never dull, despite the fact that summer vacation is winding down and her brother's production of Hamlet has finally closed, which means she no longer gets to see her crush, Eric, on a daily basis. But now that she's started school, her employer Mrs. Amberson, an agent, has acquired a new client, a rising Broadway star names Chelsea Biggs, and her aloof brother is Scarlett's new lab partner, and bent on making Scarlett's life miserable. To top it all off, each one of the Martin siblings are undergoing major changes themselves--Spencer's landed a job that has unexpectedly thrust him into the spotlight, Marlene is being disconcertingly nice, and Lola is making rash decisions--quite unlike her. With all the drama surrounding the Hopewell Hotel, Scarlett can barely keep it together. Maureen Johnson's laugh out-loud hilarious sequel doesn't disappoint with its lightening-fast action, witty repartee, and off the wall jokes that captured readers in Suite Scarlett. Readers will get to know Scarlett a bit more as she returns to school and hangs out more with friends, and attempts to deal with Spencer's crazy antics surrounding his newest job. In addition, there is plenty of action as she is once again put through the wringer by Mrs. Amberson and her crazy requests, and attempts to sort out her feelings and insecurities when it comes to Eric, while fending off the attention of another very different boy. Lola's antics add the final touch of craziness to Scarlett's life, but also force her to confront issues she had been previously ignoring, lending Scarlett Fever an appropriate amount of depth. 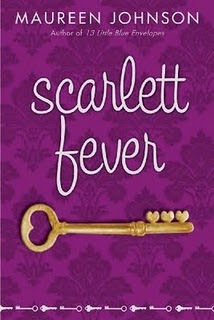 Though it did feel like Scarlett Fever was less plot-driven than Suite Scarlett, the never-ending laughs and crazy hijinks more than make up for the less distinctive plot line. Johnson is downright hilarious, and her books will keep you entertained and hanging in suspense! Cover Comments: I like the purple pattern in the background and the key motif these covers have--very fitting with the hotel theme. Though it's not the most stand-out cover, it's cute and original. Nice review. Maureen is quite hilarious and I really can't wait to read this, loved the first one. Gah, I need a copy!!! I just wish the two covers matched a little bit better. I think I like the second better.